If you are just going to open a new company and want to make some custom gift packaging for your products, you may have no idea of what style would be appropriate for your product's packaging, or no idea of what style would be popular and be liked by your customers. Therefore, in order to save time and energy, to find an experienced gift packaging box supplier who can customize any shapes of gift boxes is very important. They have professional sales who can give you good suggestions about your product packaging as well as your printing design. Guangzhou Huaisheng Packaging Co., Ltd is such an experienced paper packaging box manufacturer, cooperated with many famous brand companies all over the world. You will learn soon and have no issue to worry about even you are new in packaging if you choose our factory to be your packaging expert. Recently, one of our new clients sent us an inquiry about his paper packaging. He knew a little about it because he just started up his new business. First of all, our sales Rita asked what products he would like to pack with and if he has prepared his design or not. 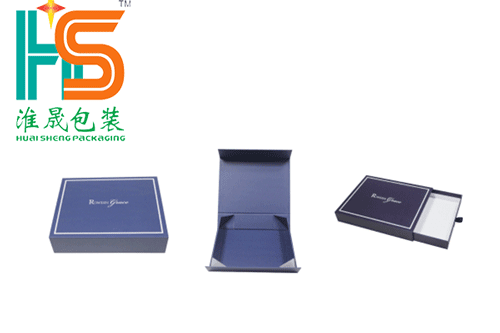 After knowing his purpose, she recommends him to make two samples for checking both quality and design, one is folding gift box, another is the paper sliding box. See the below sample boxes, which one is your favorite? You can leave us a message by email market@giftpackagingbox.com if you are interested in. In my view, the collapsible gift box is more popular than drawer box, for it can be shipped flat to save shipping cost. What’s more, it is easy to open with magnet closure. It is especially more suitable for some large products packaging, such as wedding dress, handbags. But for some small products packaging, such as jewelry, the sliding box shape would be the best for protective characteristics and a sense of mystery.